Royal and Langnickel Soft Grip brushes are ergonomically designed with thick clear acrylic handles and a soft, no slip, rubber grip. Golden Taklon is a durable synthetic that resists abuse and is suited for a wide variety of paint viscosities, while its round shape, tapering to a point, lends itself to sketching, outlining and to detail strokes as well as strokes that transition from thin to thick. 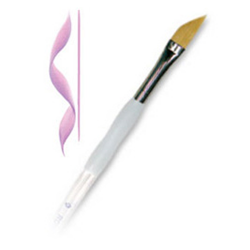 Brush tip is blue indicating synthetic golden taklon.